An important part of camping is to protect the environment from runaway campfires. 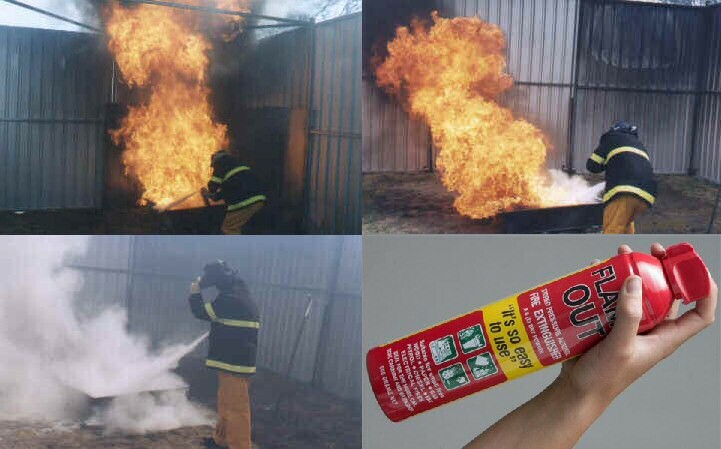 Beside the environment, you could well protect your investment in your camping gear and your vehicle and camper trailer if you purchase an inexpensive aerosol fire extinguisher for your next camping trip. 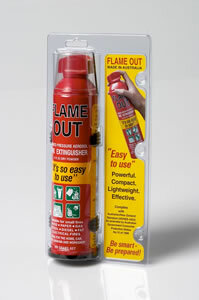 'Flame Out' 500gram Dry Powder Aerosol Fire Extinguisher. "It's so easy to use"
Men, women and children know how to use an aerosol. No complex fire fighting attachments. "It's so safe to use"
Propellant Nitrogen Gas - No Butane or CO2 gas. "It's so effective to use"
SUPER FIRE-X is suitable for all types of common fires, Wood, paper, petrol, diesel, fat and electrical fires. "It has so many applications"
'Flame Out' is suitable for camping, caravans, homes, offices, cars, trucks, tractors, garages and workshops. or even just above the page so it disappears. Click anywhere on the photo to collapse back! Stored pressure water type extinguishers are rated for solid fuel fires only. They are not rated for flammable fuel fires and may be dangerous if used on electrical fires. 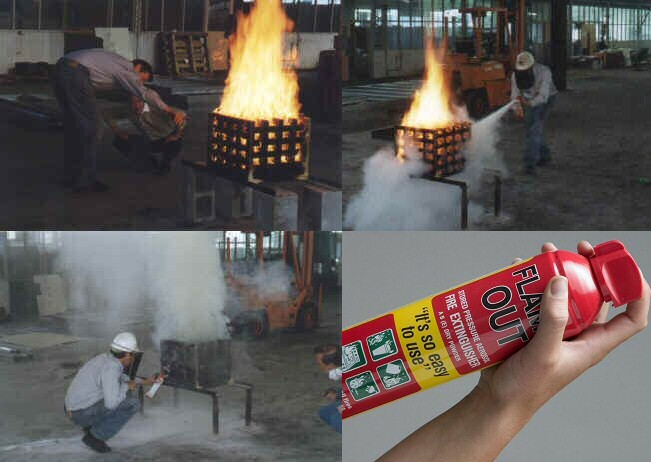 BC(E) Dry powder type extinguishers are rated for flammable fuel fires and electrical fires. They are not rated for solid fuel fires. 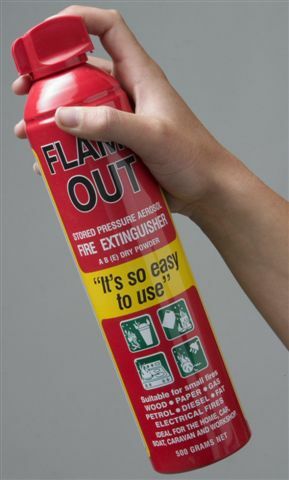 "Flame Out" is a AB (E) Dry powder type aerosol fire extinguisher. Suitable for solid fuel fires, flammable fuel fires and electrical fires.